An example of Muybridge’s 1877 Panorama of San Francisco will be in Bonhams Auction, Dec. 2 in New York. Panorama of San Francisco from California St. Hill. San Francisco: Morse Gallery, 1877. 11-panel albumen print view, 85 1/2 x 7 1/4 inches, mounted on linen and accordion-folded into 4to folder. Original garnet pebbled cloth lettered in gilt, custom cloth chemise and burgundy levant-backed slipcase. Tideline on mount below image, verso foxed and apparent on recto, mainly along the skyline, slight fading at some panel edges, folder with dampstain to tail-edge quarter, otherwise bright. MUYBRIDGE’S 360-DEGREE “PATRICIAN’S” VIEW OF SAN FRANCISCO, taken from the central tower of Central Pacific Railroad magnate Mark Hopkins’s unfinished Nob Hill home at the corner of California and Mason streets. 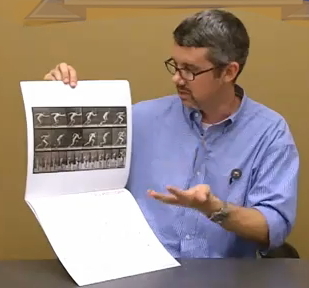 Muybridge captured the view over a period of several hours, as evidenced by the shifting shadow. The photographic panorama is a remarkable technical achievement as it took numerous calculations to correctly orient each exposure in order to assemble a continuous image. This example with the clock in the fifth panel at a quarter to two. Acquisition: purchased from William Reese Company, 2001, $17,500. An 11-panel panorama sold on eBay in 2008, closing price $42,500. From the RAA website: “In March…, the President of the Royal Academy of Arts, Sir Frederic Leighton PRA invited Muybridge to lecture at the Academy and subsequently, a copy of Muybridge’s The Attitudes of Animals in Motion (London, 1881) was purchased for the Royal Academy of Arts Library. This album of original albumen photographs published in 1881, illustrates Muybridge’s experimental track at Palo Alto and the first sequences of animals in motion, photographed during 1878 and 1879. A Royal Academy exhibition aims to prove that Edgar Degas was “more than just a painter of pretty ballet dancers”. Degas Dancers: Eye and Camera will bring together 75 works comprising paintings, photography, pastel drawings and sculpture. It will hail him as an artist ahead of his time, whose work incorporated and was influenced by early film-making and photography. 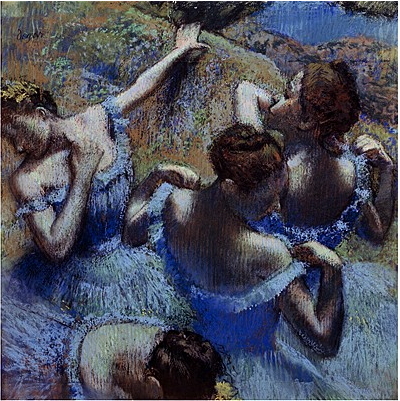 “As everybody knows, Degas is the artist most associated with dance. But, rather surprisingly, there has never been an exhibition in Britain devoted exclusively to Degas’ dancers,” said curator Ann Dumas. “I think we have a very interesting and unusual and fresh approach to this subject. I hope it will undermine the idea that Degas was just a painter of pretty ballet dancers. In fact, he was an extremely radical artist of his time. The exhibition will include the Little Dancer sculpture of a 14-year-old girl alongside the artist’s preparatory drawings, which were done from different angles and create the impression of the subject turning 360 degrees. 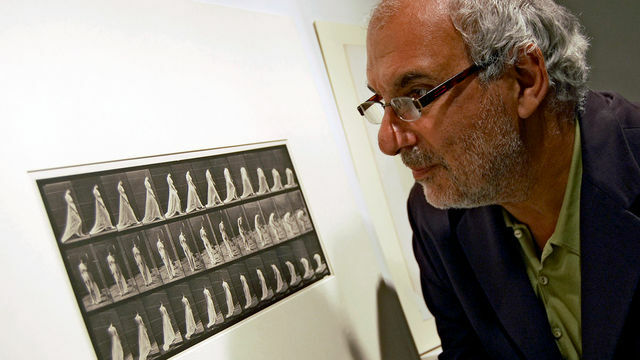 His work will be displayed alongside that of Eadweard Muybridge, the 19th century photographer, and Auguste and Louis Lumière, the French film-makers, all of whom had an influence on Degas. The show, which runs from September 17 – December 11 next year, is one of the highlights of the Royal Academy’s 2011 programme. Did Muybridge build the American Great Lakes in his Kingston back garden? There’s been a long-standing rumour about Eadweard Muybridge and a last great project he was said to be undertaking in the back garden of his Kingston home shortly before his death in 1904. The renowned photographer is believed to have been creating a scale model of the American Great Lakes by digging ponds but no one has yet been able to ascertain whether or not he really was. Artist Becky Beasley is now the world expert on the subject and has perhaps come closest to finding a conclusive answer which she unveil at her exhibition as part of the Muybridge in Kingston series at the Stanley Picker Gallery from Wednesday. “The rumour about Muybridge’s last project is something that is really interesting for me,” she explains. “A lot of people have tried to get access to his garden in Liverpool Road but there are big gated walls around the house and there was an access denied there if you like. “I wrote to the owners though and explained to them what I wanted to do and they gave me access and allowed me to take photos. “And so I made two 360 degree panoramas as there are two spaces in the garden, a small one and a larger space. Beasley’s panoramas of Muybridge’s garden will be displayed on postcards you can take away from the exhibition along with a pamphlet detailing her findings (which she is keeping tightly under wraps for now), all of which will be based on an expensive linoleum floor “For me the most ambitious part of the project is the linoleum floor I have decided to lay in the 140m square space,” says Beasley. “I have designed an image that will be put into it and likened it to making a movie as it is centrally very expensive and a one off that will only be down for two weeks. “There will be these two tall thin revolving postcard rails each with images from one section of the garden and they will be things you can take away. “Although it is very much a landscape space we have opened it up and taken all of the temporary walls down so it will be a big open space that means as soon as you enter you will see everything all at once. Becky Beasley, Muybridge in Kingston Contemporary Commissions, Stanley Picker Gallery, Kingston University, November 24 to February 5, 12pm to 6pm (not Monday), free. Call 020 8417 4074 or visit stanleypickergallery.org. 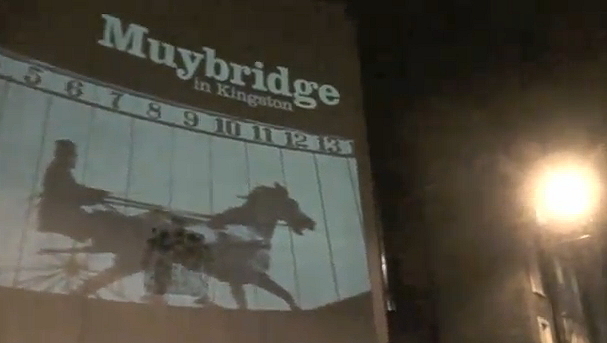 This video on YouTube, Fish Tank Tuesday, captures some of the recent nocturnal moving image projections in Muybridge’s birthplace, Kingston. 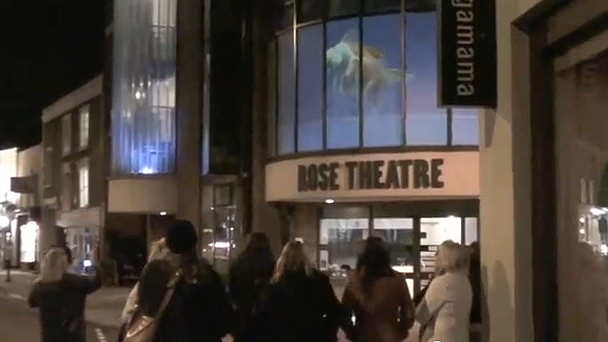 The goldfish swimming on the front wall of the Rose Theatre are just yards from Muybridge’s childhood home (the building on the left in the top photo, now a computer shop). 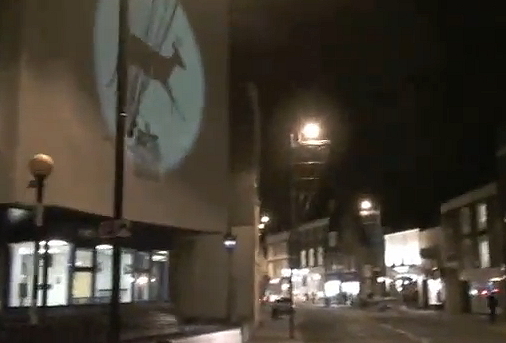 On the evening that this video was taken, just across the street from what was, in the mid 19th century, the dwelling of the Muggeridge household is a giant silhouette of a running deer – a moving image produced from Muybridge’s own animated pictures. 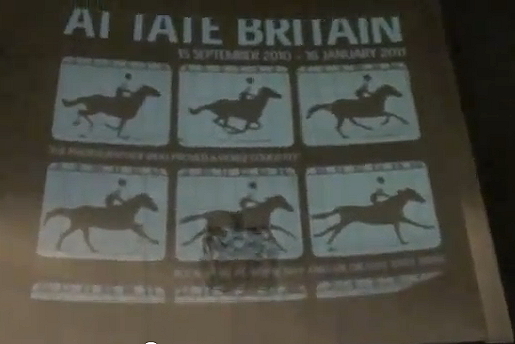 And this animation alternates with a sequence showing the frozen successive positions of a galloping horse, advertising the current Muybridge show at Tate Britain, and a poster for the exhibitions of … Muybridge in Kingston. Strange to think of the young Edward in the 1830s and 40s, peering out of those windows at no.30 but never, in his wildest flights of fancy, imagining that in the distant future the immortal results of his own life’s work would be visible as giant, glowing, living pictures on the walls of the buildings in his own hometown High Street. The NFB Mediatheque is thrilled to host a Masterclass and screening on November 13th to celebrate the work of Oscar®-nominated animator Koji Yamamura. 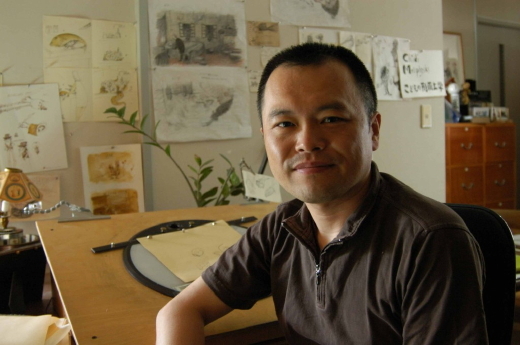 He is the most successful auteur animation filmmaker in Japan today, and his work is internationally renowned. This special programme, co-curated by Michael Fukushima and Marco de Blois and presented with Toronto Reel Asian International Film Festival, Montreal’s Cinémathèque québécoise, the Japan Foundation, and the National Film Board of Canada, represents a small slice of Yamamura’s creative output but offers a sense of his unique talent. From his first commissioned works in the early 90s, to his breakout success Atamayama/Mt. Head, through his experimentation and explorations with The Old Crocodile and Franz Kafka’s A Country Doctor, this is a must-see programme for anyone craving another look at their Yamamura favourites, and new audiences interested in one of the most influential auteur animators of his generation. Yamamura himself will be in attendance for the Masterclass. I spoke with NFB producer and co-curator Michael Fukushima to find out more about this special one-time event……. TK: What are you working on with him now? MF: Koji and I have been working on a 12-minute short called Muybridge’s Strings for a few years. It’s a co-production between the NFB, the Japan Broadcasting Corporation (NHK), and Polygon Pictures from Tokyo. At a first level, it’s a film about Eadweard Muybridge, one of the pioneers of motion pictures, but centering on a pivotal moment of violence in Muybridge’s life. But really, Muybridge and his obsession with capturing and stopping time is a mechanism for Koji to tell a story about parents and children, about love, and about the inexorable and unstoppable passing of time through our fingers. In viewing the cave paintings of primitive times, you get a sense of the energetic movement of the horses, cows, and deer. Many legs are drawn on one body, perhaps to express its running, which is recognized as the roots of animation. Through the paintings, you will feel the bliss of primitive men finding “a joy in capturing moving images”, and “a wonder of replaying the moving images” dramatized by the flickering torchlight. “Yamamura Animation Museum” starts from that cave art, and it is full of the joy and wonder of creating animation. The museum contains an exhibition of world animation history replicated by Koji Yamamura using full of his imagination, and numerous animation drawings, models, and artworks on display that show his history as a creator of animation, and there is also a corner in which to experience moving images with various types of equipment. Now, please enjoy the exhibition, enjoy the moving pictures, and let your curiosity and imagination discover the joy of Yamamura Animation.